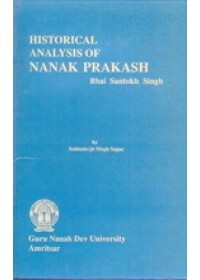 A historical analysis of Bhai Santokh Singh's Nanak Prakash can be useful. Santokh Singh is regarded the greatest Sikh poet whose popularity rests on his voluminous tomes on Sikh Gurus. Because of his believed orthodoxy, the Singh Sabha wished Max Arthur Macauliffe to consult Gur Pratap Suraj for his history of the Gurus. The popularity of Santokh Singh's works can be estimated from the fact that almost all the modern historians of the Sikhs have based their account of the Gurus more or less on his works. "References by modern authors", observes W.H. 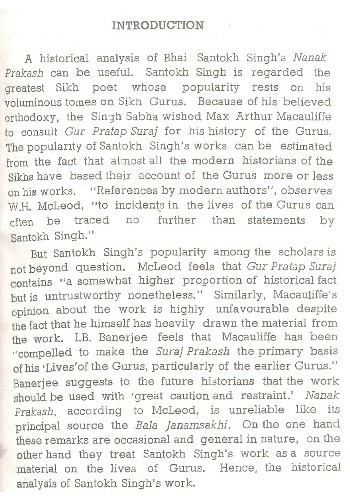 McLeod, "to incidents in the lives of the Gurus can often be traced no further than statements by Santokh Singh." But Santokh Singh's popularity among the scholars is not beyond question. McLeod feels that Gur Pratap Suraj contains "a somewhat higher proportion of historical fact but is untrustworthy nonetheless." Similarly, Macauliffe's opinion about the work is highly unfavourable despite the fact that he himself has heavily drawn the material from the work. I.B. Banerjee feels that Macauliffe has been "compelled to make the Suraj Prakash the primary basis of his 'Lives'of the Gurus, particularly of the earlier Gurus." Banerjee suggests to the future historians that the work should be used with 'great caution and restraint.' Nanak Prakash, according to McLeod, is unreliable like its principal source the Bala Janamsakhi. On the one hand these remarks are occasional and general in nature, on the other hand they treat Santokh Singh's work as a source material on the lives of Gurus. Hence, the historical analysis of Santokh Singh's work. There is a paradox in the approach of modern historians. On the one hand they base their work on Santokh Singh and on the other hand they are critical about the reliability of his works. Expressing this paradox, LB. Banerjee says that Macauliffe "had no other alternative and so long as more reliable records are not forthcoming this (Suraj Prakash) will remain, more or less, indispen-sable...." The paradox is indicative of the historical understanding that underlies it. The subject of the work is treated as a source material. All the discussion is centred on the reliability of the source. Though McLeod indicates that the work is based on earlier sources yet he does not allude to the fact that the primary concern of a work lies in the times of its compilation. He condemns Nanak Prakash for its dependence, to a large extent, on the untrustworthy Bala Janamsakhi. Besides, the modern historians seem to have failed to understand the nature of the literary work. They treat it as a historical work. Apart from this, the critical literature on Santokh Singh is meagre. Most of the works deal with his life and are exegeses of his mangal chhands. Bhai Vir Singh is the only scholar to study the works of Santokh Singh in detail. 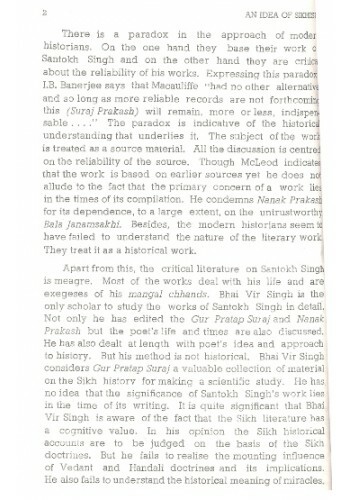 Not only he has edited the Gur Pratap Suraj and Nanak Prakash but the poet's life and times are also discussed. He has also dealt at length with poet's idea and approach to history. But his method is not historical. Bhai Vir Singh considers Gur Pratap Suraj a valuable collection of material on the Sikh history for making a scientific study. He has no idea that the significance of Santokh Singh's work lies in the time of its writing. It is quite significant that Bhai Vir Singh is aware of the fact that the Sikh literature has a cognitive value. In his opinion the Sikh historical accounts are to be judged on the basis of the Sikh doctrines. But he fails to realise the mounting influence of Vedant and Handali doctrines and its implications. He also fails to understand the historical meaning of miracles. What he tries to do is to prove the possibility of a miracle scientifically. In fact, his major thrust is on the literary merit of the work. His association with the Singh Sabha does not let him go deep into the work. Consequently, he idealises the work. The tradition of Bhai Vir Singh in assessing a work in a literary manner without keeping the historical aspect, is continued by Dr. Jai Bhagwan Goel. He introduced Santokh Singh's works to the Hindi readers. The literary worth of the works is also emphasized. Goel's literary criticism is more or less conventional. He is lacking in a historical approach. Though he is aware of the anti-Sikh doctrines in the work yet he fails to bring to light the logic of their mounting influence. On the contrary, he idealises the presence of the heterogeneous doctrines by attributing them to the poet's attitude of assimilation. Hence, the presence of divergent doctrines is looked upon as sublimity of the poet. A few other scholars have also made references to Santokh Singh. But their approach is just introductory. It is quite obvious that no systematic effort has been made to analyse historically the works of Santokh Singh. It should be kept in mind that Santokh Singh's work is not an ordinary work of literature. Like other works of Sikh literature, its nature is cognitive. In such works, literature and doctrine are complimentary as well as autonomous. The historical study of such literature needs a different approach. It is not only essential to look into the doctrinal aspect of the work but also to analyse the genre. Both the aspects are rooted in the socio-political conditions of the period. The chief interest in taking up the study of Nanak Prakash is to find its historical worth and inbuilt limitations. This is helpful in understanding the poet's historical outlook from the perspective of his literary imagination. The evidence on early nineteenth century society and politics can be understood against this backdrop. The book is the revised version of my Ph.D. thesis entitled "Historical Analysis of Nanak Prakash by Bhai Santokh Singh", submitted to the Guru Nanak Dev University, Amritsar in the year 1985. Besides 'Introduction' and 'Conclusion', the book contains six chapters. Life and times of the poet is studied in the first chapter in a manner that the relationship of his works with the politico-cultural institutions and traditions of the period could be grasped. In Nanak Prakash, the continuity of the literary tradition has a parallelism in the continuity of administrative institutions. This widens our understanding. However, other socio political connections of the literary work are not denied. This aspect is taken up in the second chapter in which the sources of Nanak Prakash are discussed in order to understand the primary concerns of the poet. In the case of present work, the bulk of the material is drawn from the heterodox sources having a peculiar socio-political implication. As Nanak Prakash is written in a janamsakhi mode it is considered useful to study janamsakhi genre in historical perspective. In chapter three, not only this aspect is taken up but also the problem as to why Nanak Prakash as a janamsakhi has collapsed is discussed. In order to know the historical worth of a literary work, the doctrinal understanding of the poet is looked into. Santokh Singh's idea of Sikh history is the theme of the fourth chapter. It delineates the impact of the doctrines on his understanding of Sikh history. Both the factors are rooted in contemporary realities. Last two chapters i.e. 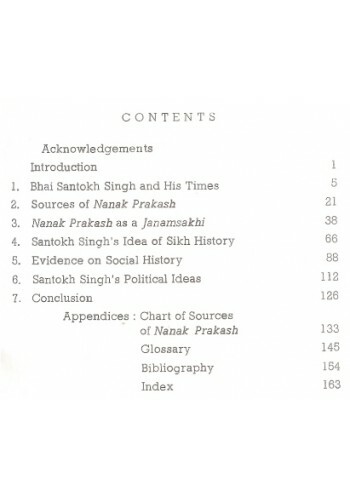 chapter five and six discuss the evidence on social history and politics available in the Nanak Prakash. This evidence plays a significant role in knowing the poet's primary concern. It helps in understanding why the poet upholds the cause of the Sikh ruling classes inspite of the fact that he belonged to a humble caste. The study of his idea of Sikhism helps us in understanding the contemporary situation. From the cover of the Book 'History and Philosophy of the Sikh Religion' By J. S. Grewal The ..
Table Of Contents For 'Sikhs and Sikhism' Book by W H MCleod CONTENTS .. Preface To 'Namdhari Guru Ram Singh And His Movement' By Kuldip Singh The Namdhari Movement was o.. 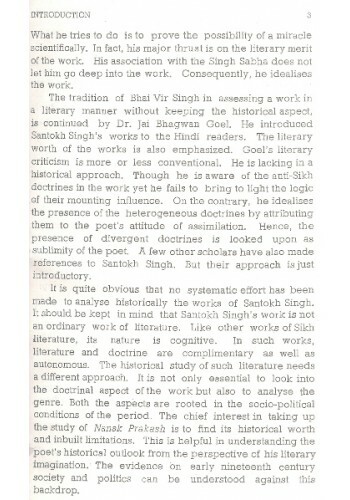 Preface To 'Historical Analysis Of Giani Gian Singh's Writings' By Dr. Sukhdial Singh Early G.. Preface To 'Tales Of Truth ( Sikh Martyrs )' By Santokh Singh Jagdev The spirit and future of any..
From The Frontcover Of 'A Reconstruction Of Sikh History From Sikh Literature' By Surjit Hans Lit..